We’ve finally come to the last part of my Weddings Trilogy, where I tell you about my experience being in Koz’s wedding last year. Except, funny thing happened on the way to writing this: I was in another wedding Saturday. So, I’ve split this into two parts. Hope you enjoy. In the movie Spider-man, Peter Parker’s Uncle Ben tells him, “With great power comes great responsibility.” Or, to put it another way, “With trips to Maui come obligations to be in weddings.” Which is pretty much what it took, because I hate weddings. To start with, Koz wanted these Tuxedos designed by Perry Ellis. The problem is, ol’ Perry doesn’t design clothes for the bigger-butted man. So I go down to the Tuxedo shop and tell them I’m in Koz’s wedding party, and they all just look at me…sort of like the citizens of Tokyo looked at Godzilla; with a mixture of fear and awe. They finally found the biggest tuxedo they could, and they promised to order one big enough for me in time for the wedding. I had my doubts. A few days later were the rehearsal and rehearsal dinner. Koz flew in my mother to play the piano, and got a ticket for my father too, so I got to see them both. I was torn with emotion. On one hand: I hadn’t seen my family for many months, so that was good. On the other hand, the nicer Koz was to me, the harder it was to kill him for making me be in his wedding. The rehearsal went okay. At first the six groomsmen looked at each other a little suspiciously, wondering whom Koz actually liked best. Then we realized we weren’t women, and relaxed and enjoyed things. One of the problems was that Koz couldn’t make up his mind and had all six of us listed as best men. This caused no end of delay, trying to decide who was to stand where, etc. I think it all got messed up by the next day anyway. To make matters worse, one of the bridesmaids was in the hospital, causing an imbalance. We were all jealous we didn’t think of that first. I had to go get my Tuxedo after the rehearsal but before the dinner, not having the money until that day, and getting into my truck with the tux I ripped an 8-inch gash in my pants. These were brand new pants, too. I decided to play it smart and just go home, which was the opposite way of the dinner, but then I talked to my father and he talked me into coming; mostly by describing the food. The dinner was good, although when I entered I noticed that the tables seemed to be segregated in some sort of hierarchy, but Koz swore that was a coincidence. Then we went over to see Koz and Teela’s new house, and it was on to the Bachelor Party. Oh, my: could I write an entire column out of that! Let’s see: first we had…. …So no one even knew if he could get the dog collar off. Then it was time to go home. What a great party! The final humiliation was the jacket. I could get it on, but my arms had to stay at a 90-degree angle, bent at the elbow, sticking straight out. I looked like pictures you see of Tyrannosaurus Rex; with those useless forearms he had sticking out. 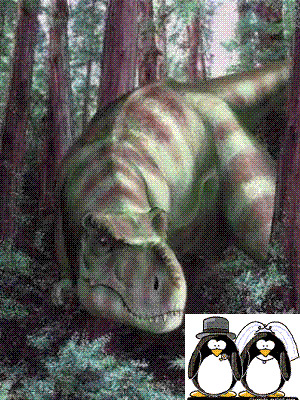 Combined with the Tuxedo I coined a new term for me that day: Tyrannosaurus Penguin. I think I’ll make it into a comic book. The wedding itself did not go all that bad. The groomsmen all showed up a bit bleary-eyed, from that great party, but soon regained their good humor. We even had several bets, like who would trip first, how many times Koz’s mom would cry, and who would get called first, the police, hospital, or fire trucks. You see; I had convinced them of the weird things that happen around me (most were Hyperion Chronicle readers). The bridesmaids were running around in a fright, worried that they wouldn’t fit in their dresses: apparently they’d been fasting for some time to get in the things. One more reason why it’s great to be a guy. Getting ready to walk in, one of the bridesmaids behind me was shaking with fright, and the behavior was infectious. Finally I stepped in to calm things. I turned around—as much as I could in my straight jacket, anyway—and told her to quit shaking; because if she didn’t, she was going to “pop out,” and as I was in front of her, I would miss the sight, and would be very upset. This was so outlandish a thing to say, that she just stared at me, but it broke the ice, and the girls calmed down a bit and walking in went fine. Later one of the other groomsmen told me he was surprised by my grace under pressure. I told him I get inspired anytime I might miss out on boobies. It was so freaking hot in that sanctuary. My grandmother always said if there’s one thing worse than a tyrannosaurus penguin, it’s a tyrannosaurus penguin who can’t stop sweating. Luckily I was bright enough to have my colored rags with me to wipe my face. I’m nothing if not fashion coordinated. There was the obligatory friend of the family warbling badly. And Teela did promise to obey Koz, although I bet this vow gets interpreted very liberally. I remember thinking that the service was awfully short. Not that I was complaining, but it seemed strange that so many months of planning and thousands of dollars had gone into something that was over in the time you could watch Jeopardy. Afterwards we had to take pictures. The reason we couldn’t do this before is because the bride and groom aren’t supposed to see each other. Can I take just a minute here to complain about this moronic tradition? I mean; it’s not like they’re Hindus in an arranged marriage, and have never seen each other ever. Doing the pictures afterwards means everyone is hot and tired (not just me), and the guests are at the reception cooling their heels. But this is how the bride Teela and Koz’s mom Ma’Oz wanted it, and as this was the only thing they agreed on the whole wedding, heaven help anyone opposed. Finally we go to the reception, which was nice. There were two cakes, some cool food, and mercifully, cool liquid to drink. At least Koz didn’t smash Teela’s face with a piece of cake. Don’t even ask me to explain that tradition. I got to see people I hadn’t seen in a while, and everyone was happy. At least until a woman slipped on some water and they had to call an ambulance. This was too bad, as I was banking on the cops getting called over some fight. But by that time Koz and Teela were out in their car, which had been decorated something awful. I don’t understand this tradition either. My dad told me that when he got married he hid his car in an underground parking garage, so his uncle and my mother’s sister couldn’t find and desecrate it. Koz’s car had the usual accoutrements and graffiti, including one funny line implying Koz was trading one ball and chain for another. Luckily, I don’t think Teela or Ma’Oz saw that. Join me for Part IIIB of this trilogy, where we answer the question: How will God punish those who continue to invite Hyperion to their weddings? In other news - what do you think of the Prenup?